The Benicia Volunteer Firemen Incorporated was founded in 1847 and is the oldest continuous volunteer fire service in California. In the early days young volunteers competed amongst themselves for acceptance by the firefighters because only the most able and deft were allowed to handle the pumper. The cityâ€™s pride shined in the well polished and cared for fire engines. Some of these original engines are still maintained by the Benicia volunteers and can be viewed at the museum and at special events throughout the year. The Benicia Fire Museum was founded in 1981 through the efforts of the Benicia Volunteer Firemen Incorporated and the Benicia Fire Department. 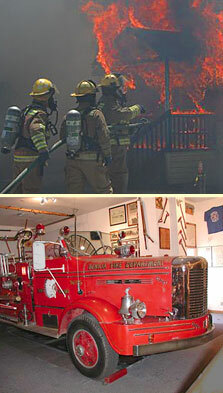 The Museum houses many treasures of fire service equipment and hundreds of related items. Fire equipment from the former Benicia Arsenal Military Reservation in also on display. Browse the links for a sampling of the historical items on view at the museum, and then come visit us!